This idea came from Sheri Alldredge - This Bear is just white 3/4" pvc pipe cut in about 1 1/4" tall sections --not including the ears. Paint the neckerchief slide brown (I painted the inside too!). 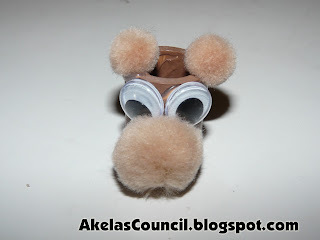 His nose is a 3/4" pom pom and his ears are slightly smaller...the eyes are 10 mm. Hope you have fun making him!